Carolyn Mink had a bucket list. On that list was watching the Kentucky Derby from the infield of Churchill Downs in Louisville. “The only thing we knew about the derby was what we saw on TV every year – fancy clothes, big hats,” said Carolyn’s husband, Barry Mink. The bucket list, however, got put aside as careers and life interfered. And then in the summer of 2016, Carolyn was diagnosed with inflammatory breast cancer at the age of 57. The couple had already started planning for retirement. The long-term goal was to move into the farmhouse outside of Oneida, Illinois, that had been in Carolyn’s family for generations. To work toward that goal, Barry took a job teaching industrial arts at Abingdon-Avon High School in nearby Abingdon, Illinois. Carolyn underwent her annual mammogram in January 2016. But a few months later over the summer, Barry said she suspected something was wrong. In her left breast, Carolyn had noticed changes in the size and to the skin’s texture. “Since she’d had her checkup in January, she didn’t think it was anything. She went in for a checkup with her doctor and her doctor was pretty convinced it was cancer,” Barry said. In addition to the left breast, there was some cancer in her lymph nodes and spots on her clavicle and liver, which indicated the cancer had spread through her system, Barry said. “It was Stage 4. Only 3 to 4 percent of breast cancers are this type and it happens to be an aggressive and more deadly one,” he said. The couple opted for aggressive treatment – strong chemotherapy followed by a double mastectomy. “The doctors weren’t recommending a double mastectomy, because they said the odds were it wouldn’t come back in the other breast, but she wanted it,” Barry said. As part of her treatment, Carolyn participated in a couple clinical trials and underwent a combination of immunotherapy and chemotherapy. Carolyn didn’t tell Barry or her sisters who helped care for her about the pain she was experiencing. Throughout her treatment, Carolyn continued to work. “She didn’t tell us the pain she was in. But she eventually got to the point where she couldn’t work and went on disability,” Barry said. That was in March of 2018. The tumors began to grow rapidly. Barry and Carolyn’s sisters, who took time off from their jobs in Seattle, Washington, and Austin, Texas, were providing around-the-clock care. They began with OSF Home Health in early 2018. “They came in a couple times a week. They got us all the supplies we needed. It was a great help,” Barry said. By mid-spring of 2018, the family turned to hospice services with OSF HealthCare. Carolyn Mink had a bucket list, and watching the Kentucky Derby from the infield of Churchill Downs was on it. When her cancer progressed, Carolyn’s sister told her about the Kentucky Oaks and tickets were purchased. The race is held the day before the derby and is dedicated t bringing awareness to women’s cancer. As the day neared, Carolyn was unable to travel so the hospice staff with OSF HealthCare arranged to rent a large screen TV for the Mink family. They gathered the day of the Kentucky Oaks dressed in pink, wearing fancy hats and watched the festivities together. Carolyn passed way 11 days later. That’s when Carolyn’s bucket list took on urgency. The Kentucky Derby was approaching. Carolyn’s sister had heard about the Kentucky Oaks, the race held the day before the Kentucky Derby for 3-year-old fillies (female horses). During Kentucky Oaks Day, Churchill Downs is decorated in pink bunting and the more than 100,000 spectators are asked to wear pink to raise money and awareness for the fight against breast and ovarian cancers. “We weren’t necessarily big horse racing fans, but when she heard about the Oaks and that it was dedicated to bringing awareness about women’s cancer, she wanted to go,” Barry said. Carolyn bought three tickets and plans were made. The OSF Hospice team set up the Minks with a travel kit – portable oxygen, medicine – everything needed to keep Carolyn comfortable for the trip to Louisville. As the day approached, it became apparent the family wasn’t going to be able to travel to Louisville, Barry said. 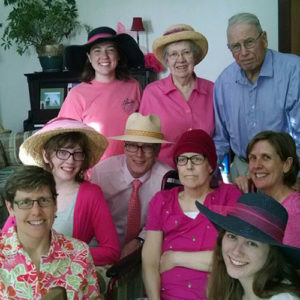 On race day, nine family members dressed in pink, wearing big hats and toasting with festive drinks watched the day’s races on the big screen. Carolyn passed away May 15, 2018, just 11 days after the viewing party for the Kentucky Oaks. Barry said Carolyn’s positive attitude held firm until the end. Having OSF Home Health and hospice in the home during the last stages of Carolyn’s life was a great relief, Barry said. Click here for resources to help determine if hospice is right for you or your loved one. Top photo caption: Carolyn Mink is pictured with her mom, Audrey. Audrey passed away December 13, 2018. She was the caretaker for Carolyn’s dad, Charles, who has Parkinson’s. Carolyn’s husband, Barry, said the stress from Carolyn’s illness took a lot out of Audrey and shows how tiring being a caretaker can be for family members.